A new solo exhibition by Liu Ye is on display in Shanghai until 20 January 2019. Storytelling takes place at the Rong Zhai mansion and presents 30 paintings by Liu, which look back over the last four decades of his practice, celebrating the skill and imagination of the renowned artist. In his lifetime Liu has lived and studied in both China and Western Europe, and his work fuses painting and framing techniques and cultural references from both. “His pictures are grounded equally in traditional Eastern and Western intellectual and artistic trends, conjoining the strengths of the past and the future.” says the exhibition’s curator, Udo Kittelmann, of Liu’s work. , 2017. Right: Book Painting No. 17 (Peter Zumthor. Architektur Denken, Birkhauser, Basel, 2010), 2017. All images photographed by Haoyue Jiang, courtesy of Prada. The Rong Zhai mansion was built in 1918 in the Jing’an district of Shanghai. The grand building is a stand-alone Western style building designed by Chen Chunjiang in the Eclecticism style. Formerly the residence of industrialist Rong Zongjing, the building is now owned, and has been restored by, Italian fashion house Prada. The restoration work has carefully retained and emphasised the French classical and Chinese architectural details that characterise the building. 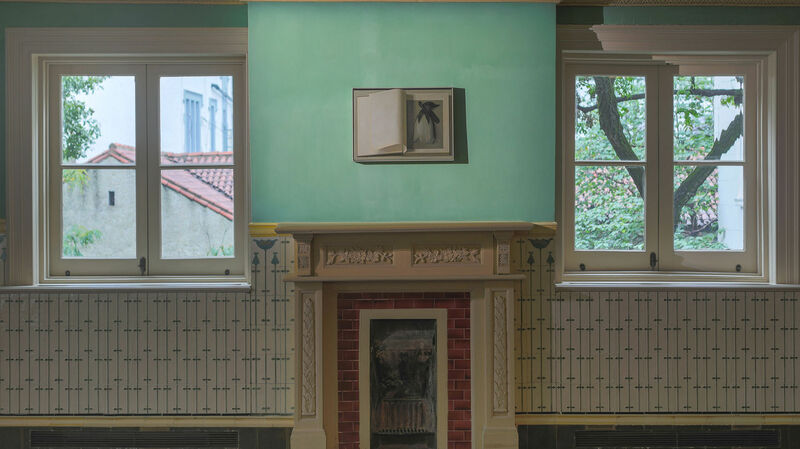 This setting echoes the styles and directions that have defined Liu Ye’s career, which has led him from Beijing to Berlin, Amsterdam, New York and back - the artist now lives in Beijing and exhibits internationally. Liu’s work constructs rather than deconstructs - rather than making overt political statements, his paintings are deceptively simple - bright, jewel-like colours and childlike characters and motifs are painted with skill and with subtle meaning. The artist melds together visual and cultural influences within his own dream-like, whimsical universe influenced, among other things, by Miffy the bunny, Piet Mondrian and the colour red.